This beautiful, luxury beachfront home has it all. It is over 3100 sq. feet with 3 bedrooms and 2 1/2 baths. Full party deck on the roof with bar and BBQ. Master bedroom has full ocean view. For technology, we have a flat screen TV in the master bedroom, a flat screen TV in the living room with DVD player, TV's in both guest rooms, satelite TV channels, Home has a monitored security system. Bring your toys! Ride your ATV's, sand rails or motorcycles right on the beach, right outside your front door on the sand. Contact for weekly rates or long term discounts. The beaches where we are are really nice, very quiet & great shelling at low tide. We are approx. 10 miles South of town. Still a quick drive on a good road to return to town for shopping, eating or other activities. The view is breathtaking. The entire front of the house overlooks the sea. The sunrise is amazing!! It is a little bit of paradise. toilet, tub, shower, This master bathroom has a large walk-in shower. toilet, shower, Guest bath sits between the 2 guest rooms. Walk-in shower. The are 4 units. 1 in the master, 1 that is for the 2 guest rooms & 2 in the large great room (all open is the kitchen, dining, living & sitting rooms. The kitchen has everything you need. Frig, stove, microwave, blender, coffee maker & coffee grinder. All pots, pans etc. are there. There is a beautiful dining area with 6 chairs. Also there are 2 bar areas with a total of 6 bar stools. Full party deck on roof with bar and BBQ. Master bedroom has full sea view., huge walk in shower and plasma TV. This house has it all, flat screen TV with DVD player, IPOD and internet hookup with satellite TV. Monitored security system. Great room with full sea view. Custom built brick domes over master bed & sitting room. We can provide cleaning service during your stay & cooking meals for additional fees upon your request. Don't look for anything else! 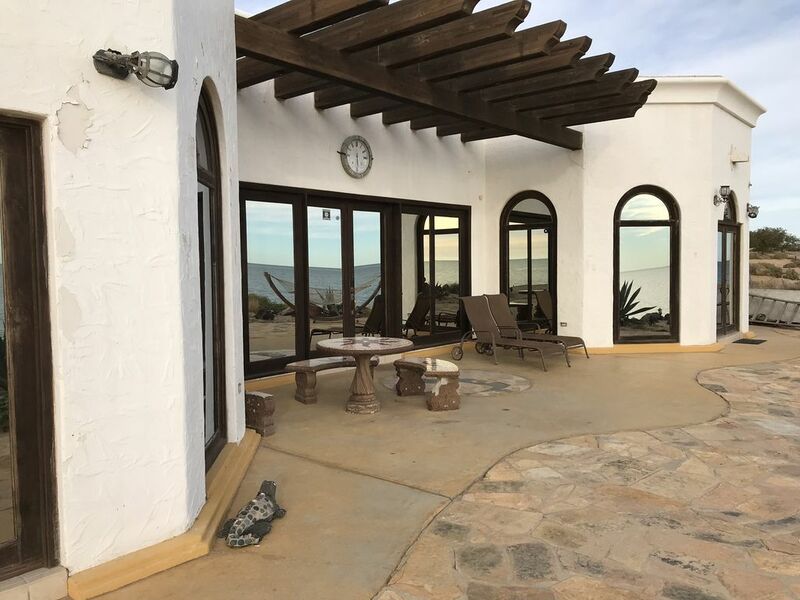 Amazing views, everything that you need this beautiful beachfront house has. Thank you Karen & Mike for sharing your beautiful home. The only thing that I would recommend is to make sure to know where are you going to pick up the keys. For us there was some miscommunication between the property manager and us. We were expecting to see someone at the house to meet us. Once we figure out what to do everything went smoothly. He answered all our questions. Other than that we had an amazing time and will definitely go back. The owners responded promptly to our request which we really appreciated because this was our 3rd house trying to book. We already recommended this beautiful home our friends and family. Thank you for the kind words. Look forward to you coming back. Dream House! too good to be true! Staying in this house was truly an unforgettable experience. The house sits right in front of the ocean. From the living room and master bedroom you can have a 180 degree view of the ocean. This is how you'd live if you're a millionaire but totally affordable for the average person. My family and I enjoyed this property so much. It was so magical. From dining under the stars on the rooftop to watching the moon rise from the ocean. I couldn't believe my eyes, I felt like I was in a dream. This house is located on a quiet side of town where you can have the beach pretty much to yourself and no one else. It's the perfect house of parties, small weddings or family gatherings. We are all so in love with this house we promised we'll be back every year. I highly recommend it! Everything about this place was perfection. It was right on the sand of a pristine beach that we had all to ourselves. The house is completely luxurious and the air conditioning works beautifully, so the August temperatures were not a problem. Leading up the the trip, the owners were super responsive and informative. Once there, the on-site manager was there for any little thing that we needed. It is a short and beautiful 20 minute drive into town. My entire family was thrilled with this place and we can not say enough about how much we recommend this place! Thank you for the kind words, and look forward to you coming back? Loved the privacy, the quiet, the open floor plan, spectacular master suite, beach location, & view. Mike and Karen were very accommodating, Ruthie was very helpful, and Jamie was very prompt and helpful. Although we had a wonderful time, property needs more regular maintenance updating. Had mice and mice droppings all over the house, had to throw away food that the mice got into... also cockroaches were found in several places. Alot of the outdoor patio and entry way lighting was not working...possibly needs new light bulbs and or new fixtures due to salt air corrosion...still was a great spot to relax and be on the beach. We are so sorry to hear about the mouse problem. We were there just before you, and never saw any mouse droppings. Jaime says that they were coming in through the master bedroom door, and we are fumigating. We spray after each cleaning for cockroaches, but a few can survive. We have decided to fumigate every 6 months to resolve these issues. Thank you for the nice comments and hope you come back soon. This house was beautiful and completely exceeded our expectations! There was more than enough room for the 7 of us, and we loved how it was decorated. The AC worked very well and came in handy in the hot and humid weather! The beach was in our back yard and only about 30 seconds away. The water was so clean and perfect to relax in (we found so many pretty shells!). The roof patio was ideal for bbqing and gazing at the unbelievable night sky, you could literally see the haze of the Milky Way!! We want to shoutout Jaime for always making himself available to us and answering any questions we may have had. Thank you for the wonderful experience and having the opportunity to stay in your home. We loved every moment and can't wait to come back, we hope you'll have us! Karen and I would like to thank you for the kind review. We agree that are house is special and that we get most people always want to come back. We look forward to your return trip. Felipe. You can fish out our front door or rent a boat at the Marina. matter what they may be. Nightly Rate: $300 - $300 Weekly Rate: $1750 - $1750 Monthly Rate: $0 - $0 Call for fees over 6 people and extended stay discounts.